This mani is what I wore this weekend to my sister in law’s bridal shower- my outfit had a mint green shirt with black slacks and a black 3/4 sleeve jacket, and this added a bit of fun all while matching perfectly! I was the incredibly lucky winner of Smitten Polish’s Spring Giveaway- I haven’t won many giveaways, let alone such an AMAZING huge prize! I won all of the Berrydrop and Speck-tacular colors- and they are all are so very, very beautiful. This is one of the Berrydrop colors- Gooseberry Gumdrop. For the Berrydrop collection, think of Illamasqua Raindrops in a rainbow of colors. All of the colors in this collection are very soft, muted pastels filled with fine white flakes. This particular color is a beautiful mint green. I used 3 thin coats- 2 coats may have been enough but there was just a hint of visible nail line. 2 thicker coats would be sufficient coverage. Then I topped Gooseberry Gumdrop off with one of my other latest additions, Elevation Polish’s Haba Xueshan. This polish was just released in March in the View From The Top Collection. It’s similar to many other black and white polishes- various shapes and sizes of black and white glitter in a clear base. What makes Haba Xueshan unique is the addition of small and large ice blue/green circle glitter. I love it! This is just 1 coat of Haba Xueshan. I had to fish a tiny bit for the circles- they weren’t difficult to find, but I wanted to have many on each nail! You can find Smitten Polish on Facebook for news and information, and purchase polishes on Etsy for $9. 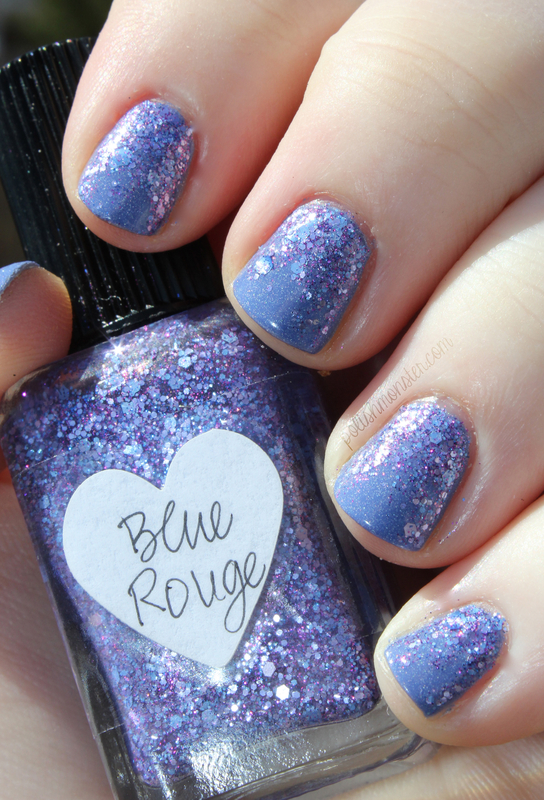 Elevation Polish can be found on Big Cartel (various prices, $8-$10), and you can follow Lulu’s blog for updates. Hi guys! I never really updated officially on the blog, but I’m sure you were able to guess that I took an extended break from blogging. I still update on my Facebook page occasionally- which I think most people follow- but I apologize for never explaining that here as well. But I’m back now! I’ve missed blogging more than I thought I would. I actually planned to return almost a month ago, but my camera cord went missing- so the pictures in this post are about a month old now! I’m planning on taking things slow initially- I’m going to make an effort to post regularly to keep myself on track, but I won’t be posting daily like many bloggers are able to do. I have a few reviews I’ve been incredibly late about posting (not polish, but polish/beauty related), so I’m going to do those this week, and then try and jump back in! Let me know what you’d like to see- right now my plan is to mainly do small, quick posts on whatever I’m wearing, but I’m open to suggestions and requests for sure! This mani uses 2 of my very favorite polishes, Above the Curve Caty Perrywinkle and Lynnderella Blue Rouge. Even though both are recent purchases, they’re towards the top of my favorite list. I happened to have them sitting on my desk together and realized how perfect they would look as a pairing! First is 2 coats of Above the Curve’s Caty Perrywinkle alone. Periwinkle is one of my favorite colors, so I was SUPER excited when Shaun and Angel debuted this gorgeous polish a few months ago. Caty Perrywinkle is a holographic periwinkle polish. It applied wonderfully, and outside in the sun it was much more holographic than my picture is showing. It’s definitely not an in-your-face holo, but it adds a gorgeous sparkle to a beautiful color. Lynnderella’s Blue Rouge is actually a lot more opaque than people realize- you can have full coverage in 2 coats easily. Because of this I opted to do a glitter gradiant with Caty Perrywinkle, so that it wouldn’t be completely covered. I dabbed Blue Rouge around the cuticle area of my nails towards the middle, and then added a second coat and drug a tiny bit downward on each side. This is one of my very favorite Lynnderella polishes ever- it’s absolutely worth the splurge! It filled with smaller periwinkle and lilac glitters, and very fine pink glitter. Gorgeous!